The Mosquito & Triad Register: BWP606M is now in France! BWP606M is now in France! A few months ago, I went for a drive with Q639FAD with my father for passenger. He enjoyed it so much that he asked me to find him a Mosquito! I then remembered that two or three years ago, Dave R., who owned BWP606M, told me he was thinking of selling his Mosquito. I got in touch with Dave and I was happy to know that the Mosquito was still in his garage. 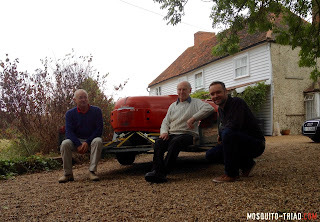 The deal was made between Dave and my father and last weekend, my father and I went to England to pick up BWP606M. It was great to meet Dave and we had a great day. BWP606M is now in France and is the 4th Mosquito in the country with ABW5J, CWL127R and Q639FAD. My father and I are going to finish the great restoration job started by Dave. 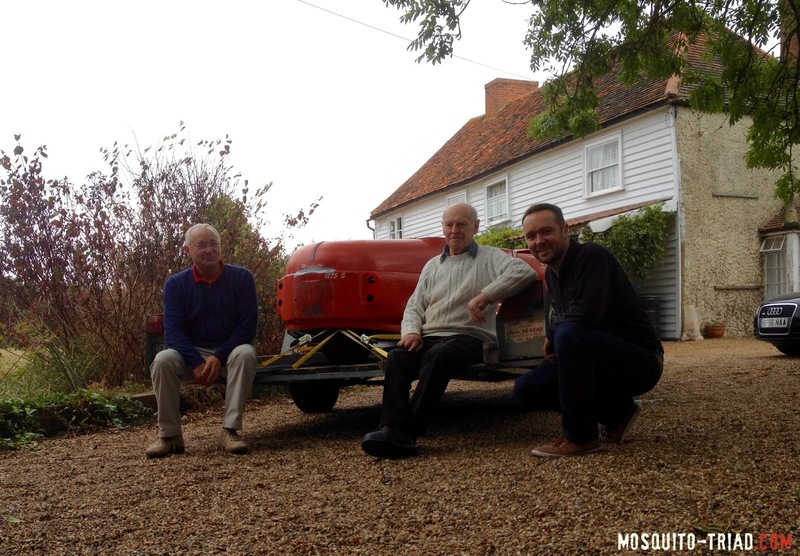 Left to right: Phillipe (my father, new owner), Dave R. (previous owner) and me.